American rocker Jon Bon Jovi has dedicated a song to two Australian brothers, after their childhood abuser was jailed for six years on Tuesday. The Bon Jovi frontman used the band’s concert at Adelaide’s Botanic Park on Tuesday night to pay tribute to two local brothers (whose identities are suppressed) who suffered abuse in the 1990s at the hands of Vivian Fredrick Deboo. Dedicating the group’s hit song ‘It’s My Life’ to the two brothers, Job Bon Jovi said, “These two brothers, they put on masks and they fought a childhood abuser. They met him in court today and he was sentenced to jail. “We have to protect our children. It’s not easy, but you have to stand up in court and face your devil. But until we realise that our most important resource — the kids of tomorrow — there is no future. 74-year-old Vivian Deboo was arrested back in December 2016, but waited until the day before his District Court trial to plead guilty to multiple counts of indecent assault and gross indecency. He has been sentenced to six years and seven months in jail. According to a set list from Bon Jovi’s Adelaide show (below), the band also performed hits like ‘Livin’ On A Prayer’, ‘Wanted Dead Or Alive’ and ‘Bad Medicine’. 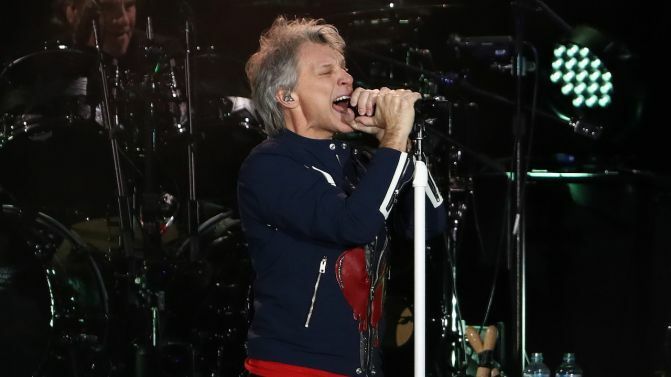 Bon Jovi’s current Australian tour — their first since 2013 — will continue in Brisbane on Thursday night, before wrapping up in Sydney on Saturday, 8th December. The tour, supported by Aussie rockers Birds Of Tokyo, comes off the back of Bon Jovi’s latest album This House Is Not for Sale.